Jeanne and Gideon Bernstein, parents of Blaze Bernstein (pictured behind them), speak at a news conference in Lake Forest, Calif., in January. Former classmate Sam Woodward, an alleged neo-Nazi, has been charged with fatally stabbing Bernstein. According to a report, murder suspect Sam Woodward belonged to the neo-Nazi group Atomwaffen and attended one of its military-style training camps. 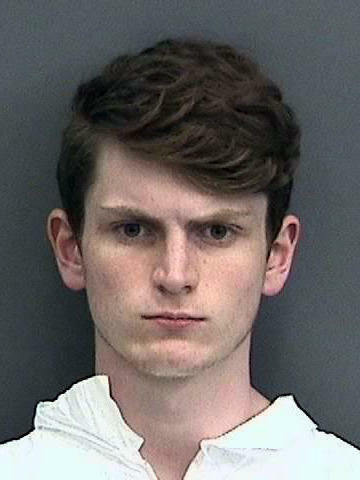 Devon Arthurs, 19, was arrested after leading police to the bodies of his two roommates at his Tampa, Fla., home last May. He has pleaded not guilty, but during interrogation, he said he acted because Atomwaffen members were plotting attacks. 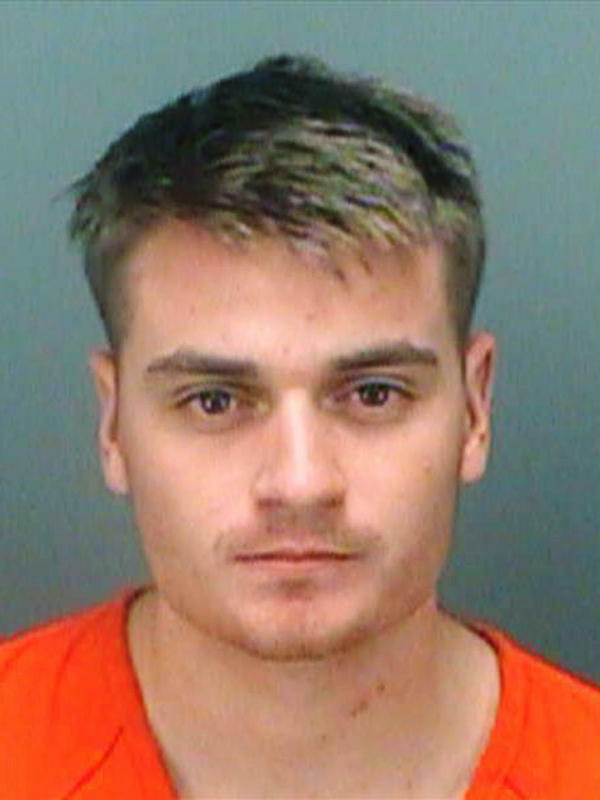 Brandon Russell, 22, considered a leader in Atomwaffen, was arrested in May after law enforcement agents found bomb-making materials in the garage of his Tampa apartment. He was sentenced to five years in prison in January. One of the group's videos shows young men, wearing scarves over their faces and camouflage, firing rifles during military-style training. The video begins with group members shouting in unison, "Race War Now," and concludes with the tag line, "Join Your Local Nazis." "Atomwaffen no doubt takes some of the white supremacist rhetoric to another level. The views that they articulate are white supremacists on steroids," said Joanna Mendelson, who follows extremist groups for the Anti-Defamation League in Los Angeles. "And what is the change they want to see? Real-world violence. Real-world apocalyptic violence," she added. In the public conversation about extremism, radical Islamists get most of the attention. But according to a U.S. government report and private monitoring groups, right-wing extremists have carried out a similar number of killings since 2001. The First Amendment protects the free speech rights of neo-Nazi groups like Atomwaffen, which was formed in 2015. Group members hide their identities and may not even know one another beyond their online pseudonyms, although some have gathered for weapons training. According to various estimates by monitoring groups, Atomwaffen is believed to have fewer than 100 members scattered across the country, with Florida and Texas considered key areas. But it keeps popping up in the news. In Orange County, Calif., prosecutors say 20-year-old Sam Woodward fatally stabbed 19-year-old Blaze Bernstein on Jan. 2. They had attended high school together and apparently went to a park on the night of the killing. Bernstein was Jewish and openly gay. He was back home for winter break from the University of Pennsylvania. "Blaze was a brilliant, colorful and charismatic man who shined light on all of the lives, and people and communities that he touched," Bernstein's father, Gideon, said at a news conference just days after his son's death. According to the news outlet ProPublica, Woodward was an Atomwaffen member who attended one of its training camps. Group members are supporting him on social media. This was the most recent of three separate attacks, and a total of five deaths, with apparent links to Atomwaffen. "All these young men, steeped in this propaganda, both online and off, went on to enact violence," said Keegan Hankes, who studies far-right groups for the Southern Poverty Law Center. "The fact that so much of it came to light in a short period of time shows how devastatingly potent some of these materials can be," he added. As far-right groups try to expand, they are operating more openly, he said. One tactic is posting flyers on college campuses. The purpose appears twofold. Groups believe they'll find some recruits and provoke outrage among others, generating the notoriety they seek. "That's why you see them trying to drive media attention, because it may get an angry disaffected young man to go to that forum and further go down that rabbit trail," Hankes said. The group is now on the radar of technology companies; ProPublica reported Tuesday that at least four have taken steps to bar material from Atomwaffen. In Reston, Va., just outside Washington, D.C., police say a couple was fatally shot in December by their daughter's 17-year-old boyfriend. The shooting took place after the couple told their daughter to break up with the boy when they learned of his neo-Nazi beliefs — reportedly linked to Atomwaffen. The accused, who is not being named because he is a minor, shot himself in the head but survived. According to Hankes, he appears to be mostly a sympathizer with Atomwaffen, though at least one report said he was in direct contact with the group. Atomwaffen first came to public attention in a double-murder case last May in Tampa, Fla.
Devon Arthurs, 19, was charged with killing two roommates. He told police he was an Atomwaffen member — and bizarrely — also a convert to fundamentalist Islam. He has pleaded not guilty. But during police interrogation, he claimed he acted to prevent attacks that Atomwaffen members were plotting and because his roommates were taunting him for his religious conversion. "In hindsight, it's very stupid what I've done. And honestly, all of this feels very surreal, like a dream," he told police in a videotaped interrogation that was recently released. Another roommate, Brandon Russell, 22, was considered a leader of Atomwaffen. In a separate case, he was sentenced in January to five years for possessing explosives. Atomwaffen was also one of the many white supremacist groups that gathered last year in Charlottesville, Va., for a rally that turned violent. "I've been doing this work for 17 years, and not to be hyperbolic in any way, but we've never been as busy as we are today," said Mendelson of the ADL. "The white supremacists are much more emboldened." They're no longer on the fringes, she said. Now they want to be mainstream. Five murders in three states since last May at first glance seemed like isolated cases, then a common thread started to emerge. Three young men have been charged - all appear to have links to the same white supremacist group. NPR's Greg Myre has our report. GREG MYRE, BYLINE: The group calls itself the Atomwaffen Division. Atomwaffen is German for atomic weapons. It celebrates Adolf Hitler and Charles Manson. Its online images are filled with swastikas, and it promotes violence. UNIDENTIFIED PEOPLE: Race war now. MYRE: Race war now. This Atomwaffen video shows young men in face scarves and camouflage firing rifles during military-style training. It concludes with the tagline join your local Nazis. JOANNA MENDELSON: Atomwaffen no doubt takes some of the white supremacist rhetoric to another level. The views that they articulate is white supremacists on steroids. MYRE: Joanna Mendelson follows extremist groups for the Anti-Defamation League in Los Angeles. MENDELSON: And what is the change that they want to see? Real-world violence, real-world apocalyptic violence. MYRE: In the public conversation about extremism, radical Islam gets most of the attention. But according to monitoring groups, right-wing extremists have carried out a similar number of killings over the past 15 years. Atomwaffen was founded three years ago. One member says about 60 people belong nationwide. They hide their identities and may not know each other beyond online pseudonyms, though some have gathered for weapons training. And Atomwaffen keeps popping up in the news. UNIDENTIFIED MAN #1: This morning, the Orange County District Attorney's Office filed one felony count of murder. MYRE: Prosecutors say 20-year-old Sam Woodward stabbed to death 19-year-old Blaze Bernstein on January 2 in Orange County, Calif. They had attended high school together and apparently went to a park on the night of the killing. Bernstein was Jewish and openly gay. He was back home for winter break from the University of Pennsylvania. Here's Bernstein's father, Gideon, describing the son he lost. GIDEON BERNSTEIN: Blaze was a brilliant, colorful and charismatic man who shined light on all of the lives of the people and communities that he touched. MYRE: According to the news outlet ProPublica, Woodward was an Atomwaffen member who attended one of his training camps. Group members are supporting him on social media. This is one of three separate attacks and a total of five deaths with apparent links to Atomwaffen. Keegan Hankes studies far-right groups for the Southern Poverty Law Center. KEEGAN HANKES: All of these young men, steeped in this propaganda both online and off, went on to enact violence. You know, I think the fact that so much of it came to light in a short period of time shows how devastatingly potent some of these materials can be. MYRE: In Reston, Va., just outside Washington, police say a couple was fatally shot in December by their daughter's 17-year-old boyfriend. The shooting took place after the couple told their daughter to break up with the boy when they learned of his neo-Nazi beliefs reportedly linked to Atomwaffen. Then there's this case in Florida. MYRE: Eighteen-year-old Devon Arthurs is charged with killing two roommates in Tampa last May. He told police he was an Atomwaffen member and bizarrely also a convert to Islam. He's pleaded not guilty, but during police interrogation, he claimed he acted to prevent attacks Atomwaffen members were plotting. DEVON ARTHURS: In hindsight, it's very stupid what I've done. And honestly, like, it feels almost like - all of this feels very surreal like a dream. 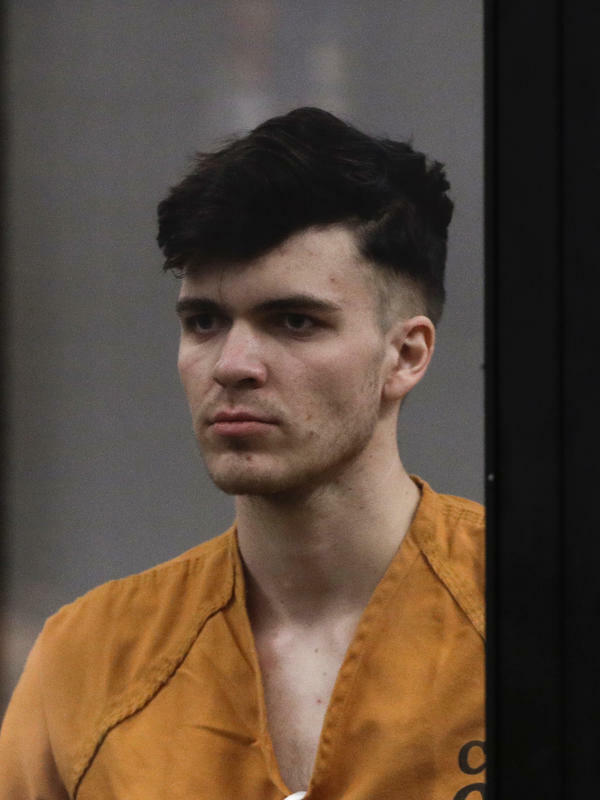 MYRE: Another roommate, 22-year-old Brandon Russell, is a leading member of Atomwaffen. In a separate case, he was sentenced in January to five years for possessing explosives. Atomwaffen is just one of many white supremacist groups that gathered last year in Charlottesville, Va. for a rally that turned violent. Here again is the ADL's Joanna Mendelson. MENDELSON: I've been doing this work for 17 years. And not to be hyperbolic in any way but we've never been as busy as we are today. The white supremacists are much more emboldened. MYRE: They're no longer on the fringes, she says. Now they want to be mainstream. Greg Myre, NPR News, Washington. Transcript provided by NPR, Copyright NPR.